Born in 1889 in New York to parents from Germany. LIved for a time in Michigan and then in Wisconsin and married Walter Frank Hauser. They had three children – Walter Hauser, Henrietta (Etta) Huaser and Marceil Lucille Hauser. My Grandmother – Marceil Lucille Hauser born in 1917 and married Emil Kufahl. They lived in Wisconsin. Had one daughter, Karen Marceil Kufahl. My Mother – Karen Marceil Kufahl was born in 1939 and married Anthony Juckem. They lived in Wisconsin and had two children, David Anthony Juckem and Marceil Ann Juckem. Myself – Marceil Ann Luedtke born in 1962 and lives in Rosevill, Minnesota. 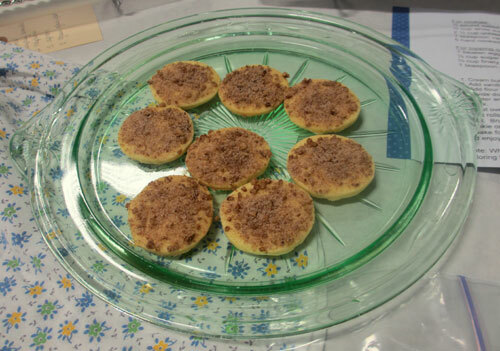 This recipe dates back to about 1909 and it is believed Great Grandma Alice learned it from her mother. The recipe has traveled from Germany, to New York, to Michigan, to Wisconsin to Minnesota and has gone through the hands of five generations. Displayed here are cookies from the Great Grandma’s recipe, an aprom my Grandma wore (possibly when she made this very recipe! ), the recipe card my Great Aunt Etta wrote, the story my mother wrote and the a depression era plate – a gift my mother gave to me. 2. Add vanilla and egg yolks and mix well. 3. Add flour and mix well. 4. Divide dough into 3 equal parts. Shape each part into a roll 1-1/2 inches in diameter and wrap in wax paper. Refrigerate at least 4 hours, but no longer than a week. 5. Heat oven to 325 degrees. 6. Cut rolls into 1/8-inch slices. Place about 1 inch apart on ungreased cookie sheet. Brush tops with beaten egg white. Mix sugar, pecans and cinnamon and sprinkle on top. 7. Bake for 8-10 minutes until brown very lightly around edges. Cool on wire rack and enjoy! Note: When made for Christmas the dough was often colored red with food coloring for the special holiday.